First-time Seattle homebuyers Kelly and Jay have been searching for the right home since last fall. Although they don't want to rush into anything and potentially end up with a home that isn't a good fit, the search has drawn out longer than either of them had anticipated, and their frustration level is slowly rising. "I was expecting this process to be much shorter," Kelly says. "We put our first offer on a place three months into the process and thought that was it." Their agent has taken them on dozens of showings, but a large part of their search has been conducted through open houses. "As the search process became more drawn out, we decided to expand our search parameters and start viewing houses that were slightly above our price point. 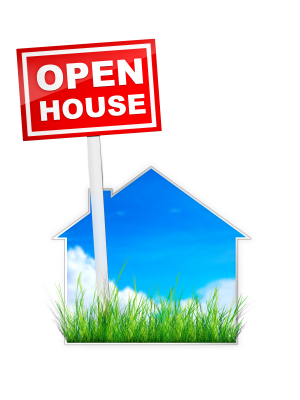 Since we didn't want to lead our agent on a wild goose chase, we went to open houses. We've probably been to about 25 so far." According to Mary Kay Perrigo, an agent working full time out of an office in Seattle's popular Capitol Hill, Kelly and Jay's experience is not unique. Since the middle of January Mary Kay and her colleagues have noticed a dramatic increase in open house traffic. This increase, she says, isn't limited to Seattle's affordable neighborhoods, but to the affluent communities as well. "One of my colleagues recently held an open house for a home that's over a million, and she was swamped," Mary Kay says. It's certainly an indicator of the changing market in the greater Seattle area. Kelly and Jay have noticed that by the time they can both find an opening in their busy schedules to view a listing with their agent, there's already an offer on the table. Mary Kay mentioned this rapid turnaround as well, adding that it's not uncommon for homes in desirable neighborhoods to quickly receive multiple offers- a far cry from where things stood a year ago. Still, many agents are reluctant to hold an open house for their listings. This could be due to outdated thinking: in the early 2000s, just prior to the huge market boom, only 28% of buyers relied on open houses, according to NAR. But that number jumped as the market improved mid-decade, and has been holding strong with our recent market recovery. 45% of buyers now regularly use open houses as part of their home search. 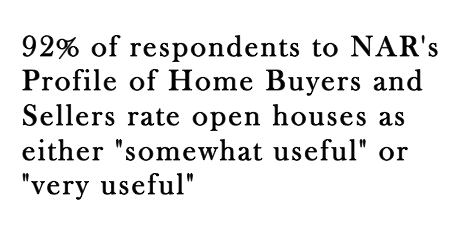 And in 2011, a whopping 92% of respondents to NAR's Profile of Home Buyers and Sellers rate open houses as either "somewhat useful" or "very useful" as a source of information. Interestingly, data from that year shows that only 61% of agents rank open houses as somewhat useful to very useful for generating leads. Why the disconnect? According to Mary Kay, this could be a perspective issue. "All of the agents in my office are full time," she says. "We all love real estate. Open houses give us an opportunity to have our sign out letting people know we're active. We can meet buyers, or just talk about real estate." Agents in Mary Kay's office are so enthusiastic about open houses that if one of them doesn't currently have an active listing, they'll frequently "borrow" listings from each other in order to hold an open house. With the real estate market still in the early stages of recovery, connecting with motivated buyers via an open house is not an unrealistic goal. For a savvy agent, open houses can be a tremendous opportunity. "After a few frustrating situations, Jay and I have decided we're not thrilled with our agent and have chosen to take a step back, save some more money, and try again with houses in a slightly higher price point," says Kelly. "Going to open houses gave us an opportunity to 'interview' a bunch of different agents. We met one who was very knowledgeable and approachable. When we begin our search again, we will contact her."